The main source of indirect evidence about Epona are several hundred statues, statuettes, bas-relifs and painted depictions of her. 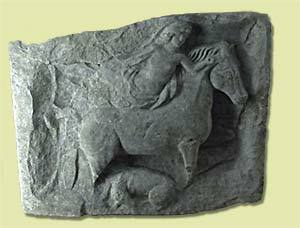 A few Epona representations are made of bronze; the majority are stone bas-reliefs in a variety of sizes. Moulded pipeclay Eponas are also fairly common. One Epona is known made of wood . 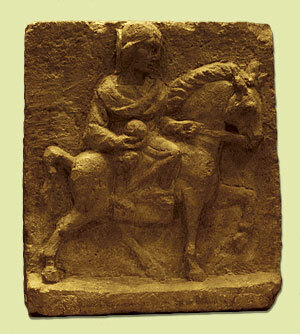 Depictions of Epona may be classified into two main types - sidesaddle and imperial. There is also a possible third type, with a cart. These types are illustrated and discussed below. 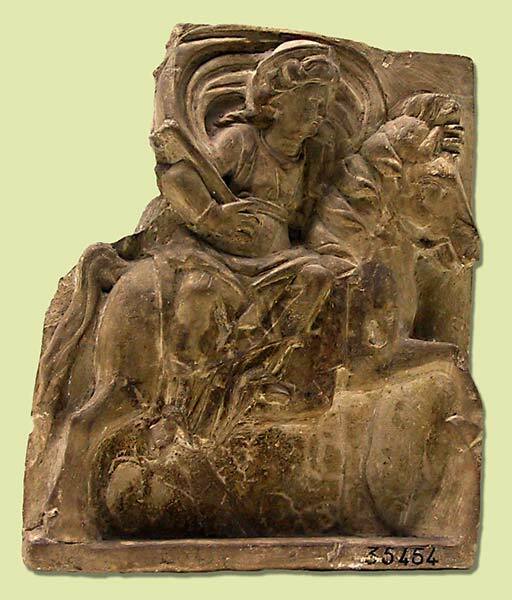 The first main type is the sidesaddle type - a woman sitting sideways on a horse. Rather than a modern sidesaddle seat where the rider faces almost to the front with one leg hooked over a horn on the saddle, this is a true sideways seat where the woman sits facing sideways as if on a chair. She usually wears a long garment that reaches to her feet and is gathered under her breasts; there may be a cloak billowing around her head. The horse or mare is usually walking (typically to the right) or sometimes, standing still. There may or may not be reins. 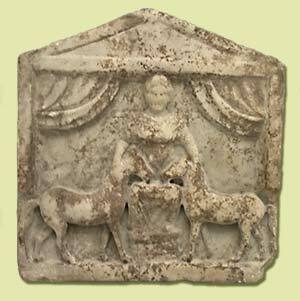 The goddess usually has her left hand touching the mane, neck, or head of the horse; sometimes she holds a cornucopia instead. The other hand typically holds a patera (offering dish) or a basket of fruits. 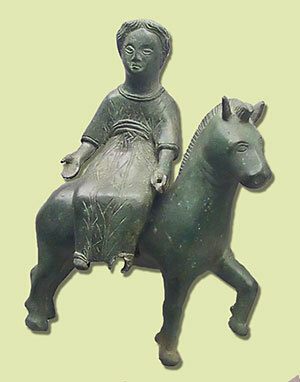 In this bronze from Champoulet [Joffroy], Epona and her mare are cast as separate items. Her empty right hand seems to be shaped as if she once held an item such as a patera. This example from Gannat [Reinach 1898 #2a; Magnen & Thévenot #79 and plate 21] shows the sidesaddle posture, high stepping walk, and billowing cloak. 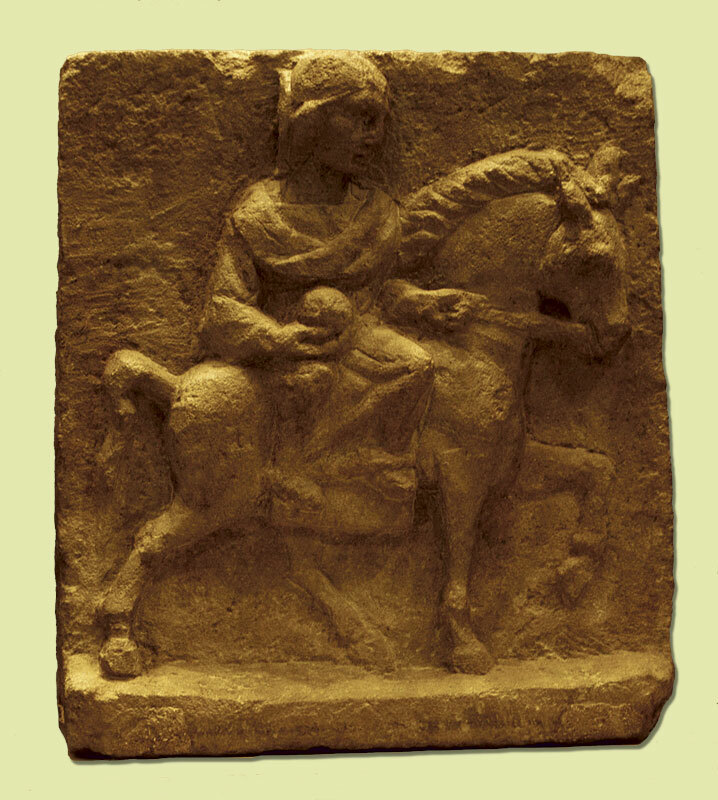 Another sidesaddle example, from Kastel [Dorow; Hettner] depicts Epona in local dress, with a long saddle cloth and bridle (or at least reins) visible. 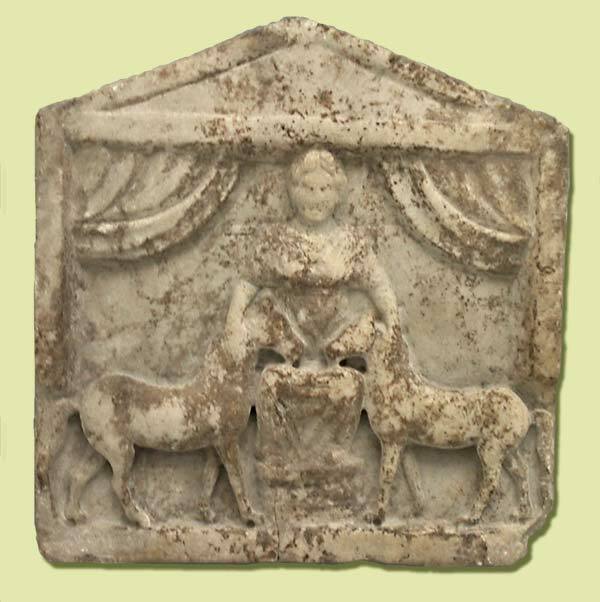 Epona carries a round object, perhaps fruit or a loaf. Sometimes, especially in representations from the Aedui area, the mare is accompanied by a foal standing, lying down, drinking from its mother or feeding from the patera. This example with a sleeping foal is from Allerey [Espérandieu #8235; Magnen & Thévenot #96]; the reclining pose of the goddess in this figure also suggests an identification with the nymphs of springs. 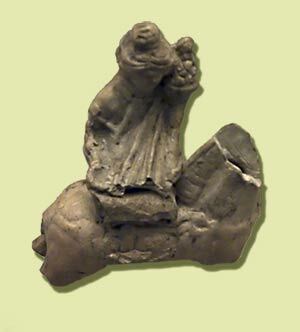 Mass-produced, moulded figures were made from white pipeclay. Inexpensive, portable and easily replaced, they were probably used in domestic lararia and while travelling. This example is from Toulon-sur-Allier [Reinach 1895 #05]. The second type shows a woman seated (occasionally standing) again facing the front. 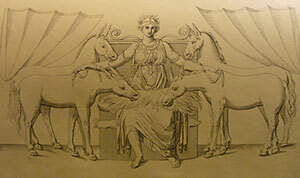 She is in between two or more horses, typically either two or four, which often turn their heads towards Epona or eat items such as wheat or apples from her lap. 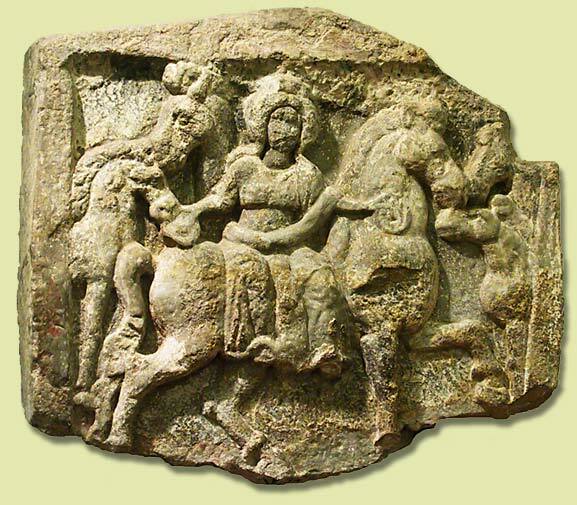 This is known as the 'Imperial' type and is more common outside Gaul, while the sidesaddle type is much more common in Gaul. 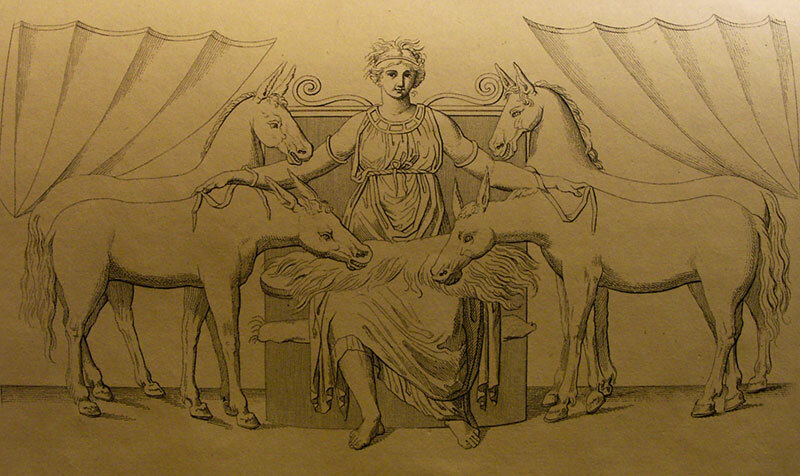 This late 18th century engraving [Bianconi, Cattaneo] shows a wall painting of Epona, once adorning the walls of the Circus Maximus in Rome. The painting itself has long since disappeared, so the engraving is the only remaining record. Here asses rather than horses are depicted. 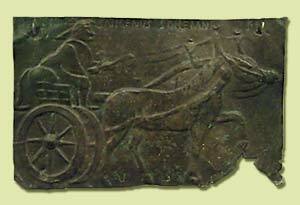 Much less common are representations of a cart drawn by mules or horses, dedicated to Epona. One, in bronze, is from Alesia (modern Alise-Ste-Reine, Côte d'Or, Bourgogne, France) [Magnen & Thévenot #4(inscription) #48 (depiction) plate 12]. 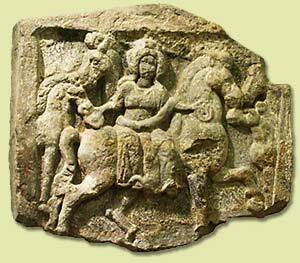 It is fair to say that this would not have been recognized as an Epona had it not had a punched inscription. Another Epona depiction with a cart is a large stone bas-relief from Beihingen (Baden-Württemberg, Germany) [Chevallier p.35; Magnen & Thévenot , #215; Reinach 1895 #65;]. 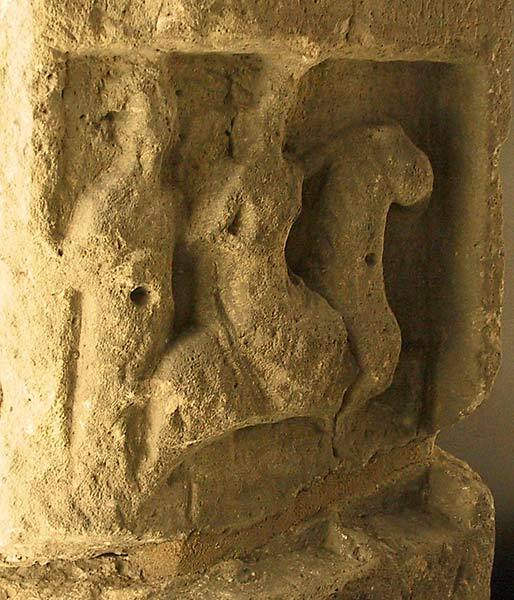 In this case there is no inscription, but the upper half of the monument consists of an imperial type seated Epona (flanked by seven horses) while the lower part shows, to the left, a four wheeled cart drawn by three horses, and to the right a scene of the sacrifice of a pig in front of an altar. Although the evidence for this type is suggestive, in general it is not possible to assert that a given depiction of a cart is associated with Epona unless there is a confirmatory inscription or significant related iconography. 1. A small sidesaddle Epona in oak, found in a rubbish tip near the thermal baths at at Saintes (Charente-Maritime, Poitou-Charente, France) [Espérandieu #1716; Magnen & Thévenot #77 and plate 17]. Bianconi, G. L. (1789) Descrizione dei Circhi particolarmente di quello di Caracalla e dei giuochi in essi celebrati. Chevallier, Raymond (1998) Voyages et Déplacements dans l'Empire Romain. Armand Collin, Paris. Joffroy, R. (1978). Découverte d'une cachette de bronzes gallo-romains à Champoulet (Loiret). Comptes rendus de l'académie des inscriptions et belles-lettres, Paris(CRAI): 795-806. Schleiermacher, W. (1933) Studien an Göttertypen der römischen Rheinprovinzen. 23. Bericht der Römisch-Germanischen Kommission. Szilágyi János György (2001) Antik művészet - vezető az Antik Gyűjtemény állandó kiállításához, Szápművészeti Múzeum, Budapest.